It's been a wooly few weeks. That right there is 2425 yds of spun yarn (of varying ply numbers ranging from 1-3), totalling 51.3 oz (3.2 pounds) and 20 oz more of handdyed BFL fiber that I got distracted with somewhere along the line there (more on that later perhaps). Clockwise from the right side: 3 skeins of 3-ply Romney from Hello Yarn in "Timber" with a mini-skein of chain plied leftover singles, 1 skein of merino/alpaca/camel/silk blend from Krafty Koala that I picked up at Knit Nation and couldn't resist, 5 mini-skeins (~30 yds each) of natural colored Shetland that I spun up as bulky samples for a biiiiiig sweater coat project idea percolating in my head. Then there's a teensy skein of purple merino/Shetland blend that Judith handed out in her class at Knit Nation which I finally plied and washed. Next up: my experiment with thick and thin singles in Amy's "Twenty Ten" Corriedale. Then David's glorious Polwarth in "Cairns": one skein of 3-ply and one skein of 2-ply from the leftover singles. Finally, in the middle, 4 skeins of incredible drapey mohair/nylon/merino from Hello Yarn again. Originally one colorway ("Loch") of orange/olive/blue/green, which I split into two color groups and spun separately. The Romney is going to become a sweater for me me me, and I think Loch will be some kind of triangular shawl with some garter ridges. The rest of it is as yet un-assigned to particular projects. Once again, the Tour de Fleece was an absolute blast. I did about 12 oz more then I managed last year (one of the goals on my List), got through one of my (at least) three sweater lots of Hello Yarn fiber, and got to spin new-to-me fibers (Polwarth, mohair blend, merino/alpaca/camel/silk). Plus I've got material for several weeks of Fiber Friday posts. 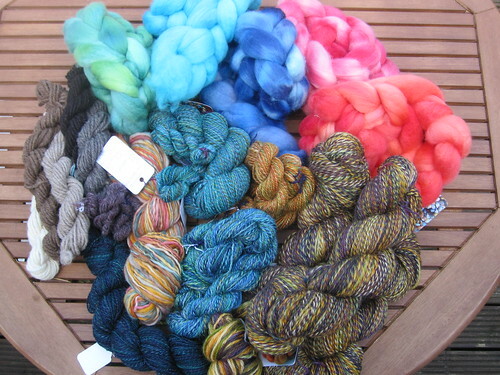 Written by porpoise On July 25, 2011 In "Tour de Fleece", "spinning"